Libelium launches a new line of Calibrated Gas Sensors in order to offer accurate readings of the gas sensors present in both our Waspmote and Plug & Sense!. This new line is born as a necessity of some clients who needed to get maximum accuracy in their industrial, environmental, agriculture and farming applications. Improve your gas sensor readings from relative levels to ppm’s accuracy. Read more. Libelium will start offering the calibration service for gas sensors to get an accuracy of a few parts per million (ppm) in the measurements. This service, demanded for a long time for our Waspmote Developer Community will be available in a few weeks. If you have interest in this new line of calibrated sensors contact our Commercial Department. The new Waspmote Plug & Sense! line allows developers to forget about electronics and focus on services and applications. Now you can deploy wireless sensor networks in a easy and scalable way ensuring minimum maintenance costs. It has been specially designed to be scalable, easy to deploy and maintain. 50 Sensor applications for a Smarter World. Get Inspired! More than 50 billion devices will be connected to the Internet by 2020, but this new connectivity revolution has already started. 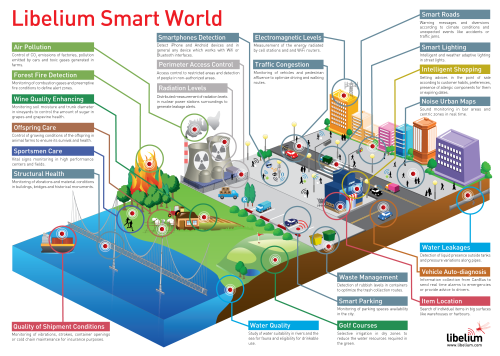 Libelium publishes a compilation of 50 cutting edge Internet of Things applications grouped by vertical markets.